Suspected Taliban militants patrol after they reportedly took control of a rural district in Afghanistan's central Ghazni's province in May. During their rule in the 1990s, Afghanistan’s hard-line Taliban banned photography, television, and the Internet by declaring that taking pictures of living things was forbidden in Islam. But two decades later, the Taliban are savvy about using modern communication technologies, social media, and smartphone applications to win the war for Afghan hearts and minds through a relentless propaganda campaign. Tweeting frontline photos, posting attack videos on Facebook, and widely circulating leadership pronouncements and viewpoints are now central to the Taliban’s military and political strategy to recapture power through frontline advances, winning over public opinion, and altering perceptions. Over the past 15 years, the Taliban propaganda machine has evolved from handwritten shabnamans, or threatening letters delivered at night, and chants on audio cassettes to a robust social media presence, a network of multilingual websites, and an informal android app after a botched attempt to launch a formal one. 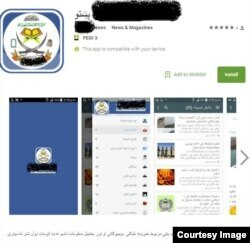 An Taliban application for smartphones using the android operating system. Majeed Qarar, a writer currently serving as a cultural attaché at the Afghan Embassy in Washington, has followed the Taliban’s online presence for years. He told Radio Free Afghanistan that in addition to propaganda the Taliban are using social media as a recruitment tool. He says the Taliban are effectively using Facebook to identify and neutralize opponents among the closely knit Pashtun clans of his native Ghazni Province in central Afghanistan. Kabul-based researcher Hekmatullah Azamy says most Taliban propaganda focuses on provoking emotions to brainwash people. He says the insurgents increasingly rely on social media to attract Afghans to extremism. During their regime, the Taliban ran only one radio station and two newspapers, but now they have a host of multimedia platforms. Their formal website, Voice Of Jihad, relays insurgent messages in English, Urdu, Arabic, and the two major Afghan languages, Pashto and Dari. Other websites such as the Pashto-language Nun Asia, or Asia Today, serve as Taliban surrogates while claiming to be independent and impartial. In 2011, Abdul Sattar Mawandi, an administrator for Taliban websites, said their information campaign aimed to win over Afghan hearts and minds. Azamy says the Taliban have allocated a separate budget for media aimed not only at sharing information about their war efforts but attracting people’s sympathies. Over the years, the Taliban propaganda efforts have grown. The group has a commission for “media and culture” while two purported Taliban spokespersons appear to be available round-the-clock. Taliban messages are quickly disseminated online by a network of social media accounts on Twitter and Facebook and a host of groups on smartphone messaging apps such as WhatsApp, Viber, and Telegram. Most journalists working in Afghanistan or covering the country receive insurgent statements directly to their inboxes. The Taliban use smartphones to frequently share audio and video messages. Azamy, who has seen some of these videos, describes them as a propaganda tool. “They show people videos of concerts, especially women at concerts, and tell them, ‘See these videos. There is no Islam in Kabul,’ ” he said, noting that most such videos are not of actual parties in Afghanistan but a thinly veiled effort to instigate hatred against the Afghan government among the country’s conservative population. After the demise of their regime in late 2001, the Taliban centered its propaganda efforts on showing that Afghanistan was occupied by the United States and its allies. But in recent years, when former U.S. President Barack Obama ended major combat operations and withdrew most troops, the Taliban’s propaganda efforts turned their focus to ethical issues. Another pro-Taliban account on Twitter. Critics fear that Kabul is losing the battle for Afghan hearts and minds in the absence of a comprehensive information and media strategy. Dawlat Waziri, an Afghan Defense Ministry spokesman, acknowledged their vulnerabilities. “We have been working on this problem. The communications ministry has shut down many of their accounts, but it is an ongoing effort,” he said. Bureaucratic lethargy often prevents Afghan officials from issuing timely responses to Taliban claims. Unlike the insurgents, government forces cannot publish photos and videos from the battlefield, which limits their ability to contest Taliban claims. Ahmad Shah Sadat, Afghanistan’s acting communications and information technology minister, says Kabul is trying to control the extremist propaganda over the Internet by recently adopting a new law. “All organizations have agreed to ban websites and social media accounts in Afghanistan that are active against the state and promote terrorist propaganda,” he said. So far, the insurgent propaganda campaign appears to be unaffected by government efforts.